How To Personalize (Boring?) Basics. I’ve stumbled onto one of the best advantages about aging and style: boring no more! Two decades ago I would have worn an upscale gray skirt like the one I’m wearing here with a solid sweater, black tights and basic pumps. Maybe added a simple pendant. Age and style confidence lets us play with closet basics and make them personal, and fun. 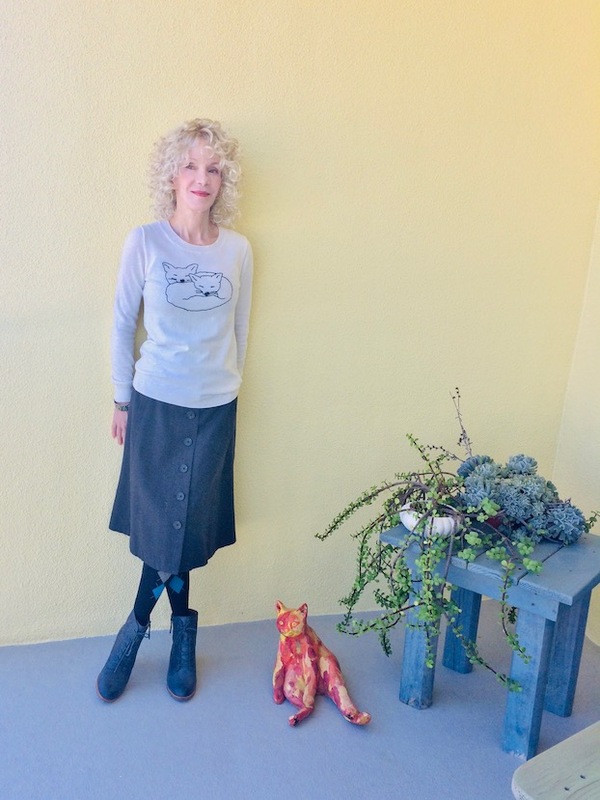 The sleepy foxes below are a personal touch that I’ve come to love: a tee or sweater with a positive message or image. This sweater is a lightweight cotton, purchased retail at J. Crew Factory. How I wish my cats would cuddle each other like these foxes. Instead, there’s a couple of hisses/growls, and they move along with tails swishing. This curly wig is one of my new favorites, it’s kind of angelic-looking (heh!). The button-front skirt has great lines, and feels like a fine wool blend. I thrifted it at the Greenwich Village Goodwill. Argyle tights are a playful touch (and it’s chilly in Florida today – 68 degrees!). Are you enjoying your fashion freedom (I think you are!)? Show us in the link-up. Previous Article← Body Positivity At Any Age. We Deserve It. Cold and tights at 68F – that’s a warm summer’s day in the UK!!!! I absolutely love that hair of yours – yes it’s a wig but it’s amazing! love that sweater! It is so cute!!!! looks really soft. Definitely NOT boring basics or boring neutrals. The cat sweater is adorable and suits you. Love those argyle tights too and the pattern-mixing. I’d love for you to join my linkup currently on the blog. Perfect for this outfit too since it is a skirt-themed linkup. Thanks and welcome by, <3 Ada. I adore that sweater, I have been contemplating the purchase and now you are really pushing me towards yes I need it. Patti, what a cute look on you! I love the preppiness of the argyle tights! It really works. And I agree about the curly wig–it looks natural and sweet on you! You look awesome, Patti! I love the fun sweater. Isn’t it great to be able to feel free to wear whatever the heck we want? I love it – so liberating. So love your sweatshirt and foxes – they are so wiley and independent. We sometimes spot one wandering round in the countryside near us. They always make me smile. I love that shirt! And how fun are those tights! Haha! My blood runs cold after 33 years in Florida! Thanks for linking up, xox. Pugs cuddle up like those foxes : ) I guess we need another one for Zoë to love but I don’t know if my house can accommodate that much more fur. I already have difficulty keeping up with her shedding. I adore Le Petit Prince. It is one of my favourite books of all time. I think you’ve really claimed your unique sense of style and this outfit shows it off brilliantly. The right mix of classic and quirky. I adore your sweater Patti! I’m crazy about foxes, they are such fascinating, beautiful creatures. I’m thinking of getting a fox tattoo…not sure my husband will approve! HI Patti! You cant go wrong with some basics, and I love the kitty print! The argyle tights are cute too! You have got some great hairstyles with thos epieces! what about that! that is my theme today! love how those tights make your outfit super cool! cute lil sweater! Foxes are totally my spirit animal so I am dying over this top! And I do love the argyle tights for a little extra something! Such a great outfit. And yes to your curly wig!!! That wig is fabulous on you Patti! Thanks for the link up! Your Hair is fantastic! And the top is so cute. Thanks for hosting and have a great start of the week. Totally agree Patti, we do enjoy playing with the not so predictable as we age. Love the top , tights and boots. Many thanks for hosting . Not sure why my image is on its side again ,oh well. Hello, Jill! I think your new hair color is quite beautiful, and I understand how we can be disappointed at the salon, as well. Have a wonderful start-of-Fall week ahead, xox. You look stunning. Love the cats sweater. Do you really still need tights down in Florida? This week people up here in the Interior ran already around in Bermudas and T-shirts with flip flops as temperatures were in the 50s. Such cute tights! Love those with the blue boots. 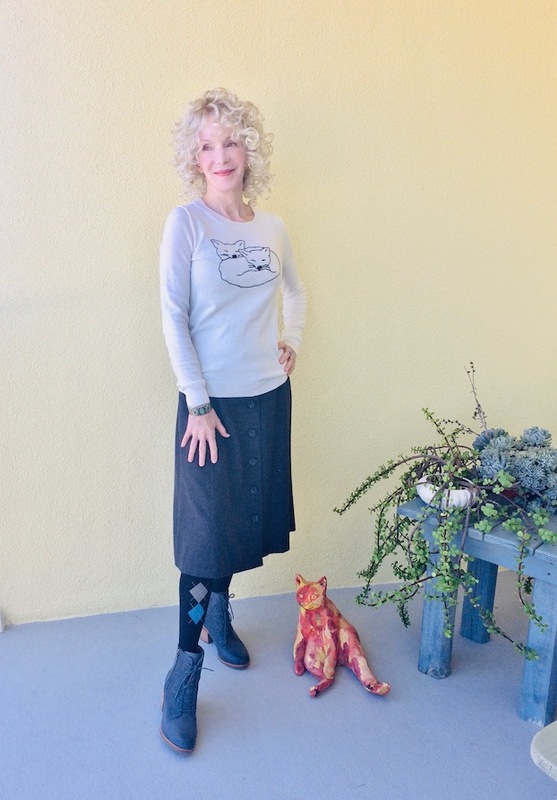 And the fox shirt looks great with your skirt. Love the outfit! Love the shirt. The tights would be way too hot for me with the weather in the 60s. I would save them for fall. I love jazzing up dull basics like my old jeans and a hoodie with long, wild earrings, colorful boots or shoes, a few crazy color streaks in my hair and red lipstick or brilliantly colored eye liner. The average person would run screaming from what I consider my “closet basics”. The foxes and the curly hair — so sweet! Gosh, I feel exactly the same way, Patti. Bring on the fun pieces and take chances with our clothes. And those tights?? The absolute best!! Patti, you’re a foxy chick. And a very chic one too. I’m finding that my fashion tastes are evolving into a much less conforming style. So freeing and less restrictive. You’re a fabulous mentor on how to achieve this. Thanks for the inspirations. Love the sweater with the graphic. Reminds me of when we all did Not Lambs challenge all over social media about 5 years ago. Yes the curly hair is fab. Thanks for the link up and have a good week . Love this cute “basic” sweater with foxes hugging . We need some positive signs sometimes to cheer up even if it is just a cute print like the one you have on your sweater . The skirt looks neat and warm perfect in between season.